Yosmer Solorzano was signed in late 2014 for $100k as a nearly-18-year-old, which is a year or two older than is typical for higher bonus prospects. Baseball America reported a velocity jump to the low 90's and some physical development that brought him attention as a relatively late bloomer. Skipping DSL ball entirely, the right-hander made his pro debut in the AZL at age 18 and acquitted himself well for someone making that leap: a 3.45 ERA, 1.27 WHIP with 16 walks and 43 punch-outs in 62.2 innings as a starter. 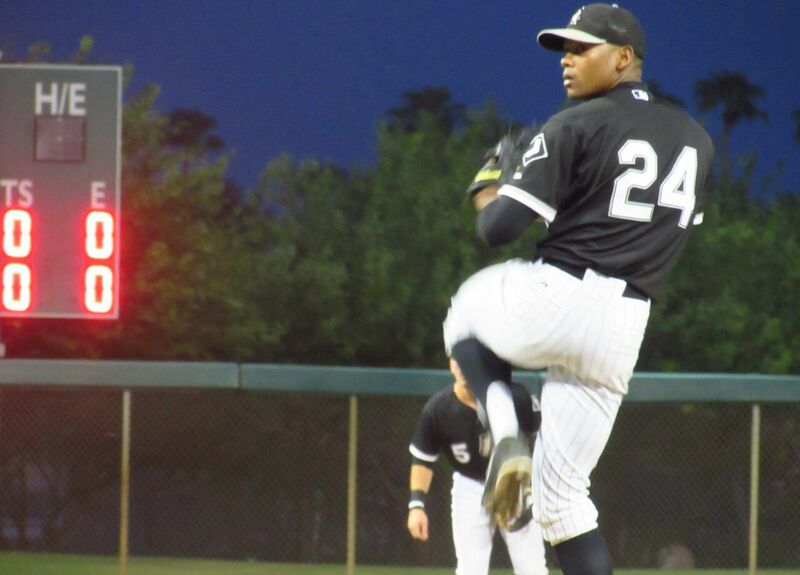 In 2016, he was kept in extended Spring Training to protect his arm given his development curve (that per a White Sox official), and was then assigned to rookie-level Great Falls for his age 19 season. There he posted decent core numbers (i.e. a 4.11 ERA) and strong peripherals (2.0 BB/9, 9.0 K/9, 55% GB rate) in a hitter-friendly league. 2017 saw him hit full season ball for the first time and it didn't go terribly well: 6.28 ERA, 11.0 H/9, 3.9 BB/9, 6/9 K/9 in 24 starts (23 with Kannapolis, 1 with Winston-Salem). Yosmer started 2018 surprisingly as a reliever in the Kanny bullpen, making 13 appearances and posting a 4.43 ERA with 19 strikeouts to 13 walks over 22.1 innings. In June he transitioned back to the rotation with poor results; 5.95 ERA, 62 innings, 39 strikeouts, 33 walks. Those results are not encouraging, especially when repeating a level, and Solorzano's future trajectory is unclear. When Solorzano is pitching well, he forces hitters to pound the ball into the ground, generating a GO/AO rate of 1.71 for his pro career thus far. His fastball has heavy sink, and he has both 4S and 2S offerings, though both appear heavy. Velocity ranged from upper 80's to 92, more often at the lower end of the range in rookie ball, though at his age he could improve that going forward. His leg kick and physical build have drawn body and form comps to Orlando "El Duque" Hernandez. The delivery is pretty low effort, and he's got a calm demeanor on the mound. A local analyst gave him high marks for pitchability. The velo is low enough as a pro that it's a concern (at least for now) and his offspeed stuff still hasn't matured. Going into his age 22 season he'll need to prove he can get guys out in A-ball and show a bit more velo to jump back onto the prospect map.